Needham street is named after William Needham, a partner in the Butterley Company during the 1850s. He was also a trustee of the ‘Ironville Benefit Building Society’ the group responsible for selling the original building plots on the area of land now occupied by Needham Street, Wright Street and Jessop Street. The owner of this land in 1854 was the ‘Ironville Freehold Land Society’. In the first half of the 1800s this was the site of Brick Kilns before Needham street and Wright Street were built. 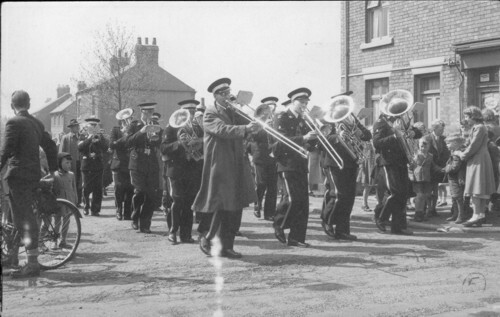 Fig.1 Codnor St. John Ambulance Band just approaching the top of Needham Street on a Sunday morning Wright Street Chapel Anniversary march during the 1950s. Field Street was an area of land used for temporary housing (Pre-fabs) after WW2. The Prefabs were eventually knocked down during the late sixties, when Field street as we know it today was built. 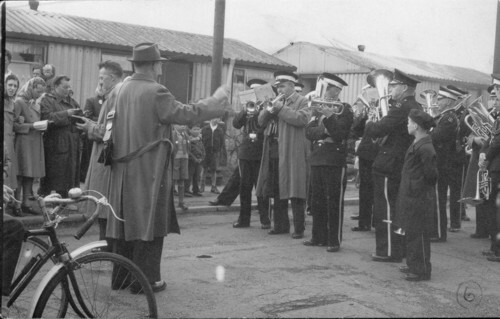 Fig.2 & 3 Codnor St. John Ambulance band outside the Prefabs on Field Street. 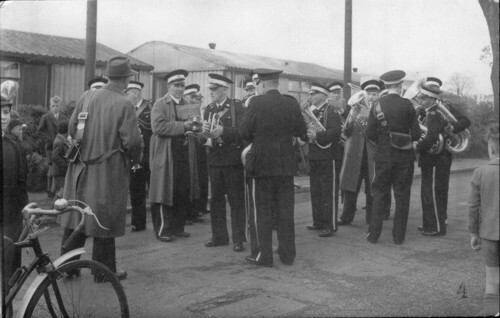 Some of the band members are: Reg Sharp (with his back to camera) Ernie Lamb, Grenville Webster, Harry Parkin, Clive Hawkins, Vincent Grainger, Jack Parkin, Jack Payne and Ron Saint (my father) third from right facing camera. The boy with the bicycle is Barry Whitehead and two of the ladies on the left are Jillian Woolley and Barbara Wilson. 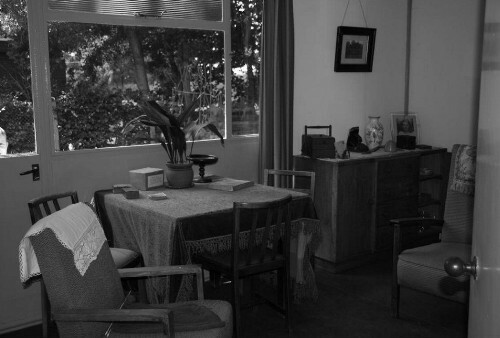 Prefabs were designed by the Ministry of Works to provide a quick solution to the massive lack of housing caused by the war. 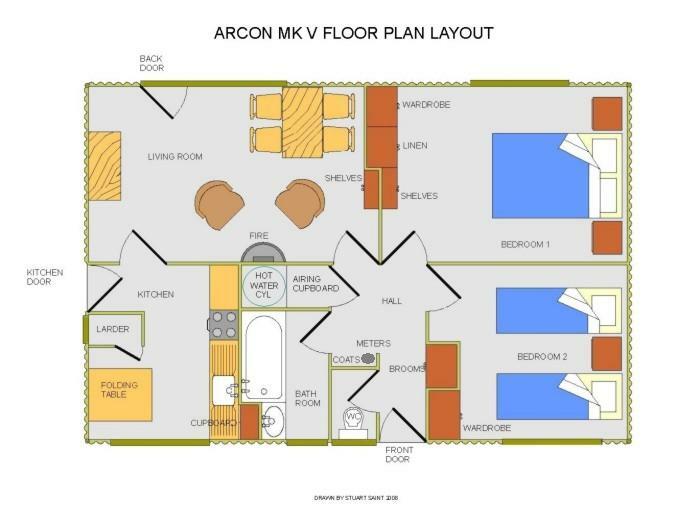 The Arcon Mark V in the above photo was one of the most common type of Prefab and approx 38000 were manufactured by Taylor Woodrow. It was built round a tubular steel frame, with corrugated asbestos cement cladding, and a curved roof apex. Below is a floor plan showing how the rooms were arranged. Note how the Kitchen and bathroom are back-to-back allowing all the pipework to be hidden in the wall. There are also 2 bedrooms a living room and a seperate toilet. Although the prefabs were only ever intended to be temporary accommodation, they often proved to be better equipped than most houses of the time. 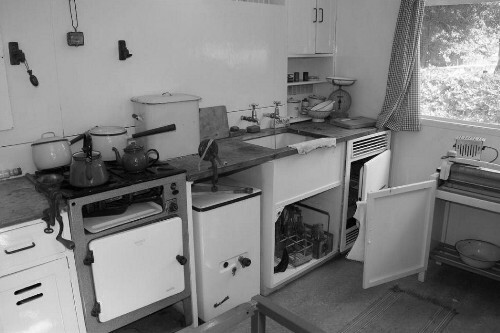 Fig.4 Many of the prefabs around the Needham street,Field street area were Arcon Mk V.
Fig.5 Inside a Prefab Kitchen.